Like any sport, playing tennis requires you to buy your own gear—especially if you plan on taking it not just as a hobby but also as a way of staying fit and healthy. Aside from the usual sports gear you need including shoes and clothing, the primary item you have to purchase to make the most of tennis is a trusty, durable, and appropriate tennis racket. Tennis rackets can vary according to size and user level—there are rackets for beginners and experts, usually depending on how easy it is to handle and use. The best tennis rackets for beginners are ideally easy to hold, lighter than the usual rackets, and not as expensive. Then again, it is also worth noting that some pricey rackets may be worth the investment especially when proven to have high quality and if you intend to play tennis for a long time. Now, there are three known brands when it comes to the best tennis rackets for beginners. It features a large head measuring 112 square inches. This maximizes every smash you make because of its large scope. It also means lesser errors and better turns because it covers a wider space. It is longer than most rackets. The extra length provides the player an extra momentum for every shot. It also makes the racket a little lighter and easier to handle, complimenting the large head it has. It has Stop Shock pads. What makes tennis a tiring sport is holding the racket. This one comes equipped with stop shock pads to somehow lessen the stress brought by a heavy racket. It also absorbs your energy which results to more powerful shots. The plenty choices you get with this brand is great for when you want to buy a racket that’s just right for practice. Its big head makes it great for beginners. When you are still learning the sport, learning how to do a proper smash can be challenging. 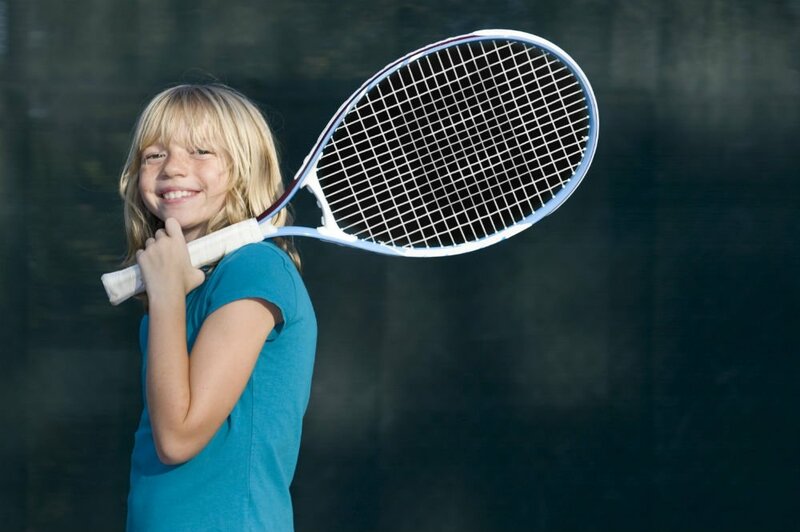 This racket’s big head allows you to hit well, even for a beginner. Its built-in pads make it easily maneuverable. A heavy racket can be hard to control, even harder when you are trying to hit a ball. This racket’s soft pads absorb shock and help you take that winning shot. It might be a little heavy for a beginner racket. Most beginners would want to use a lighter racket and then eventually switch to heavier ones when they have learned enough of the sport. This one weighs 326 grams, no thanks to its oversized yet functional head. The grip is not as good. 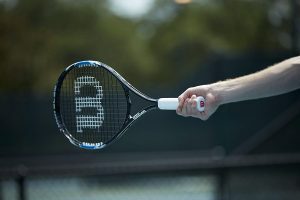 The tennis racket grip is one of the most crucial factors you have to consider if you wish to play tennis competitively. As it appears, the weight of this racket does not help with its grip. It features a fan string pattern. This pattern is known to produce more winning shots. It also adds to the aesthetic quality of the tennis racket, which most beginners look for as well. It has an oversized head measuring 115 square inches. The head is one of the main parts of the racket that should be considered before purchasing. The size of the head affects the scope of your shots, and also contributes to the weight of the racket. Despite the large head, it is lighter than most rackets. Light rackets continue to be the best tennis rackets for beginners. Newbie tennis players who are still learning the rules and tricks of the game naturally look for rackets that are easy to control and maneuver, because the heavy ones wouldn’t give them that for sure. It isn’t just for beginners, but for intermediate players as well. When it comes to technical specifications and measurements, this brand is surely a winner. Its large head and weight add up to great control and ease of use. It is not as durable as the others. We dare say that with great power, it is perhaps easy to feel the game and be more intense with every shot. Too bad, this racket might not be ready for that for now. It might be because it is lightweight, but it still depends on how you use it. There is too much string tension. It could be due to how it was strung, but too much string tension causes excessive vibration which could affect your shots. It comes with a short pink handle. True to the brand, this very feminine tennis racket is made eye-catching with the pink handle. The white and pink combination also adds to the appeal of this racket. Its head strings feature has a Hello Kitty bow print. Stamping the strings is a bow print, a signature feature of any product under the brand. Its size is relatively small. This racket is just right for beginner tennis players and even kids who wish to play the sport for fun. Its short handle and right-sized head make this racket very easy to use since it is light. You can easily control your shots and more often than not, never miss the ball again. It might look like a toy, but the fact that it is strung means you can use it for playing, though it might not be used for competitive tennis. It can be used by kids aged 8 and below. That makes it a kids’ racket, definitely not one of the best tennis rackets for beginners out there. Well, except if the beginner is in that age bracket, then why not? Its strings are of cheap quality. Because it was intended as a racket for little girls, the makers might have thought that such strings are enough for this one. When it comes to choosing the best tennis racket for beginners, the factors you should consider are size, weight, and ease of use. The strings and grip should also be taken into consideration, as that would determine whether or not the racket is worth the investment and is right for you. Among the three beginner rackets mentioned above, the Winter Tour Slam Tennis Racket might just be the best one. It has a large head, strung and durable strings, and shock proof pads for easier control. Then again, it will always depend on your preference and deciding factors, but that may be a good one to try.